Am I talking about the dogs again? As far as vegetable purees are concerned I tend to be very conservative to allow the main ingredient to shine in all its glory. Yes, I’ve been known to mix two veggies together, for instance Broccoli & Spinach, Carrot & Sweet Potato , or Cauliflower and Celeriac, but those are exceptions rather than the rule. However, the other day I was staring at the bag of parsnips I got with the intention of roasting them and faced a disappointing state of affairs. You’d think that those bagged creatures would all be more or less similar in size and shape? Don’t get your hopes high! They place one or two gorgeous specimens with a bunch of pencil-thin cousins. Pathetic. I learned a lesson, of course, will never buy bagged parsnips again. I’ll pick them myself, thank you very much, and they will be all chubby. But, I digress. 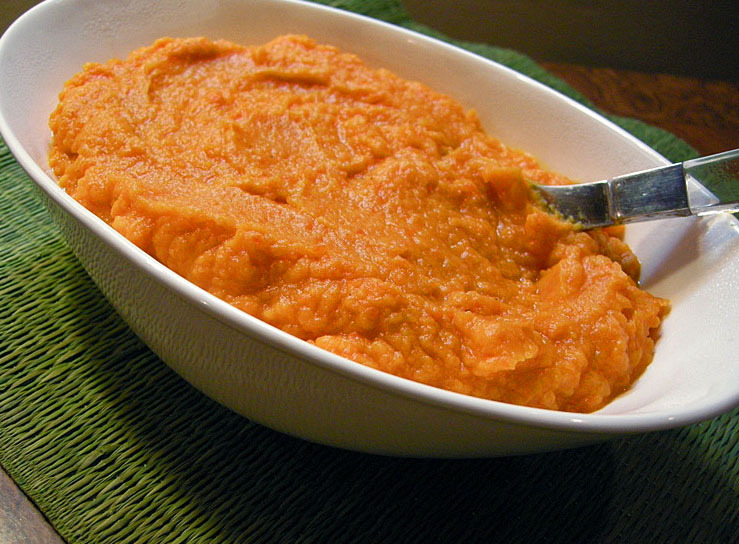 I was staring at the parsnips and decided that they could work better in a puree of sorts. Since I did not have enough for a side dish, I also grabbed some carrots. And then, the tiny orange cauliflower winked at me. So there you have it, not one, not two, but three veggies cooked together in harmony. I must tell you, this turned out much better than I expected, especially considering I kept it very simple. No exotic spices, no garlic confit, not even chicken stock… I let the veggies sing, and the music was gorgeous! Heat the butter and oil in a large pan, add the diced celery, season lightly with salt and pepper and cook until translucent and fragrant. Add all the other veggies and cook in medium-high heat stirring occasionally for a few minutes. If necessary, add a tiny amount of olive oil to prevent the veggies from scorching. Add the two cups of water, season with salt and pepper again, and cover the pan. Simmer for 25 minutes in low-heat. When veggies are tender, remove them to a food processor, leaving most of the water behind. Process and add more water if too thick. Adjust seasoning, and serve right away. Dinner is served! 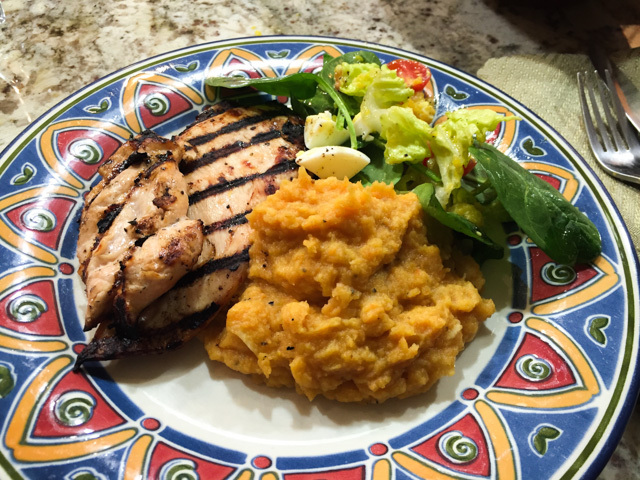 Simple grille chicken breasts, mashed veggies, and a salad. Very delicious way to end a busy Monday. Regular readers of my blog will likely say to themselves – there she comes AGAIN, with yet another recipe for mashed cauliflower. When is she going to stop? Probably not in the near future, because I keep finding interesting ways to enjoy one of my favorite side dishes. This version turned out pretty tasty, so I must share with you, magnanimous person that I am. I got the idea from a post over at Closet Cooking, and made a few changes to use what I had around in the fridge. The spinach adds a lot in terms of flavor and nutrients. This one will definitely be a regular appearance at our table. 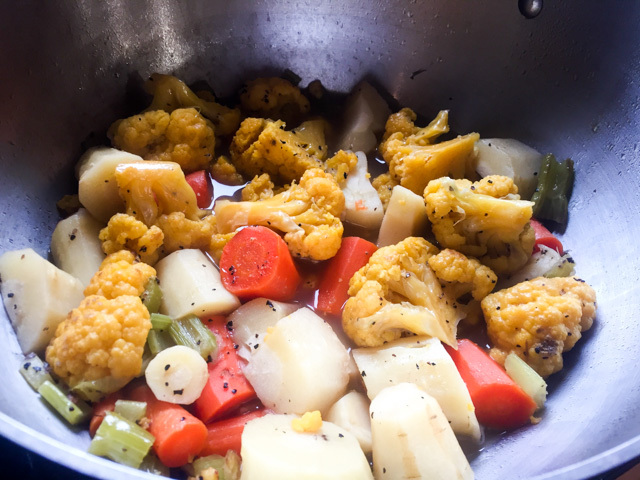 Place the cauliflower in a steamer over boiling water and steam until fork tender, about 10 minutes. While the cauliflower cooks, sautée the fresh spinach in olive oil until wilted. Season with salt and pepper, add a little lemon juice and reserve. 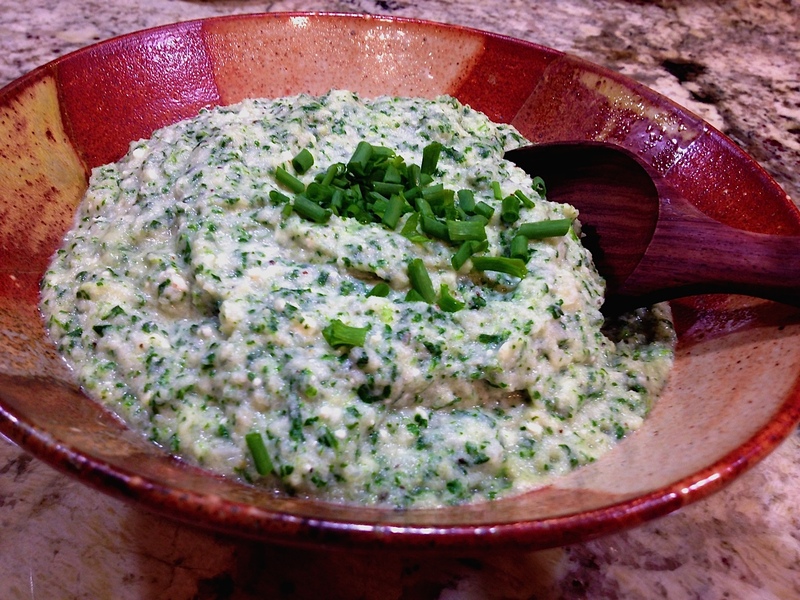 Place the cooked cauliflower in the bowl of a food processor. Add the feta cheese, yogurt, nutmeg, salt and pepper, and process until well combined. Add the reserved spinach, process for a few seconds. If too thick add almond milk until you reach the right consistency. 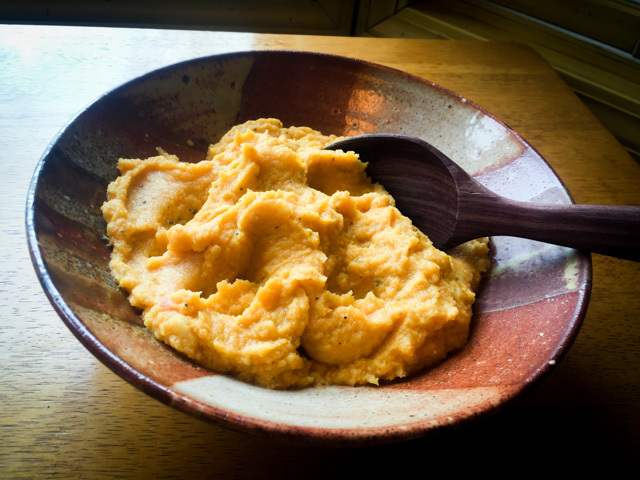 The puree can be warmed up for a minute in the microwave if the cold ingredients added to it cooled it down too much, but probably it will not be necessary. I loved this take on cauliflower puree so much that I made it again the following week, using kale instead of spinach, and adding a little bit of sun-dried tomato to the mix. It turned out almost great, but not quite. A few details that I should have paid more attention to compromised the quality of the dish. I used chopped kale, pre-bagged, thinking it would make my life a lot easier. Well, it did, but it didn’t. In the bagged version, the stems are chopped together with the leaves, so because I cooked them very little to preserve that nice bright green color, the stems were a bit tough. Not pleasant in the middle of the smooth cauliflower puree. So, my advice is to either go for spinach, or if you like the assertive taste of kale, buy the leaves, and chop them. If the food police is not around, you can discard the stems, but if you have guilty feelings about it, cook the kale in two steps, stems first, leaves at the end.